Vistaprint is a big international operation. It prints everything from business cards to mugs and, judging by a quick glance at the comments on its website, often doesn’t do it all that well. Just take a look at some of the complaints I found on Vistaprint’s business card page below to see what I mean. There were plenty of other unhappy customers to choose from, with complaints about print quality, trimming issues, and late deliveries common. Some of these problems are down to the company. But others are down to the buyers not understanding what is required for successful printing. That picture you dragged off Google for a background image looks great on screen, but will look awful on your business card because the resolution is wrong. It probably won’t be in the right colour format. Fonts that look great on the online designer are unreadable on the real thing…. But Vistaprint’s marketing sets out to convince everyone that they can be a graphic designer. They can’t – it’s just not as simple as making a Word document. Honest. And then there’s the price. Vistaprint are cheap, right? Well, once you’ve negotiated past the ‘free’ offers, upsells of business card holders or ‘deluxe’ paper and paid for delivery, you might find they’re not so cheap after all. 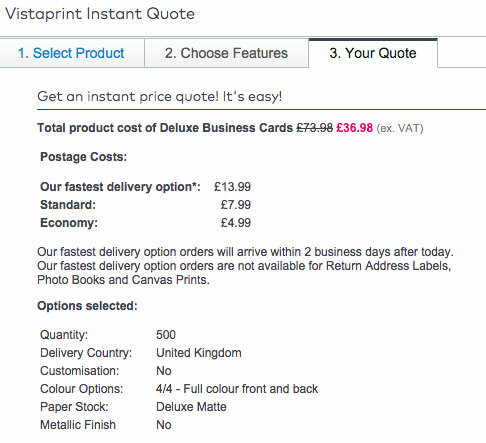 So if you go for the fastest delivery option, 500 cards will cost you £58.37 including VAT. Our silk laminated cards are printed on 400gsm stock (the thickest in common use – hard to tell what thickness Vistaprint’s are). The price is £39.99 including VAT and courier delivery. Two-day turnaround is standard. They’re printed in the UK and nobody we’ve sold them to has ever been disappointed with the quality.